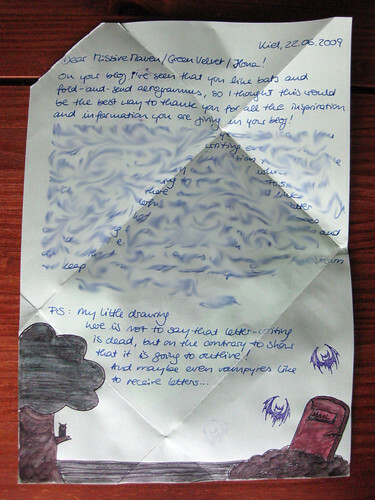 This blog reader letter from Germany has to be one of the most creative and lovely ever. Of course it included bats so I'm sold, but it's also a fine letter. It is a self-fold, a really fine job that was secured with stamps and included the clear note of where to cut without marring the contents. I tried to blur out some of the text in a careful way so that you can see the fold lines in case you want to fold a letter like this. Bats! An owl! A vampyre reference (love the Euro spelling)! I've left the first paragraph and postscript intact so you can read them: View large. Oh - and I've just gotta say how much I love that bat stamp. And you gotta get a closer look at this fine artwork (View large, and here's the P.S. larger. 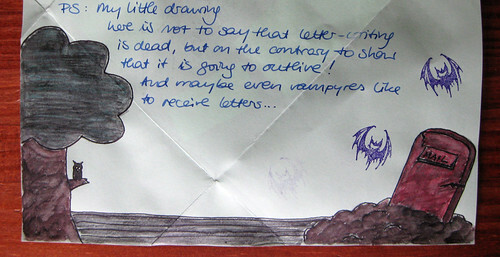 In case you can't read it, she wrote: "My little drawing here is not to say that letter-writing is dead, but on the contrary to show that it is going to outlive! 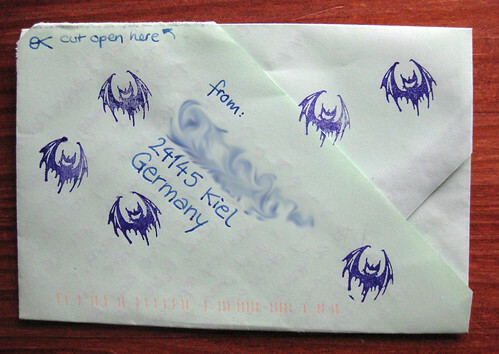 And maybe even vampyres like to receive letters..."
Even the front was fun, with cool stamps and a Luftpost sticker. And what's the little sailboat saxophone dude? Love him! 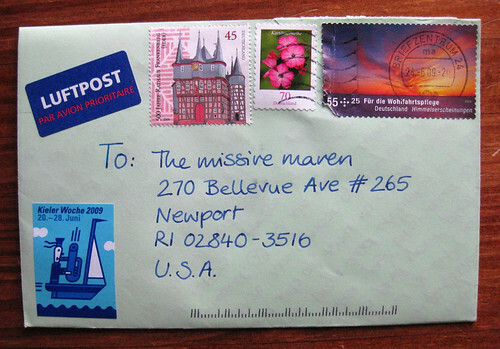 You must wint the award for the most awesome letter receiver in the entire unniverse . That is absoloutly adorable . You see I have the habit of fan folding my letters and tying off with a ribbon so that not only do they keep the letter but they have the ribbon I sent as a keep sake which I thought was cool . But after seeing some of these I am such an amateur at this really . I say bring on the foo-fa-lah !!!! It's true, I am rich in fine letters! The little sticker is an advertisement for the "Kiel week" which is a famous boat show that takes place in the city of Kiel in the North of Germany. Thanks for the sticker info, Cathie! Fun tidbit.